It’s October, and of course October is that wonderful month where every horror magazine, television special, and website rolls out a list of the greatest horror movies of all time and the movies that should be on everyone’s Halloween Horror Must See List. The two major problems with most of those lists are that they cover the same turf that most of every other list covers, and the turf they all cover is looking at the well-known, oft watched classics. We’re not going to do that. This series is going to look at the movies that are out there that don’t make everyone’s list every year and that some of you may have overlooked in the annual avalanche of horror DVDs on the market. Yeah, I know. Some of you are wondering if you opened the wrong column or not, and maybe you’ve hit the They’re Not Bad… column by mistake. Well, you didn’t click the wrong link. This movie is an old one with a number of elements in the film that are showing their age badly, and you have some wild overacting by some of the actors portraying main characters. But I just can’t put this one on that list. For one thing, this movie pretty much came out the way it was supposed to. This is what it was intended to be. Also, it’s not a “so bad it’s good” type of film because it’s not really bad at all. 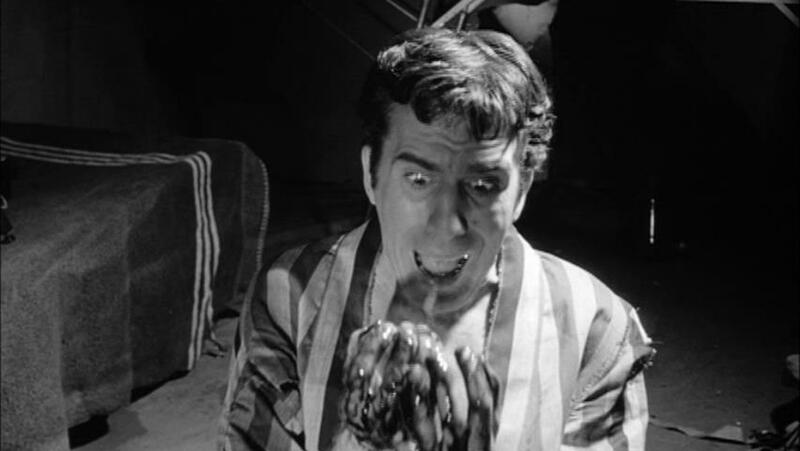 If anything, The Flesh Eaters is a very enjoyable classic from the era of the mad scientist films. 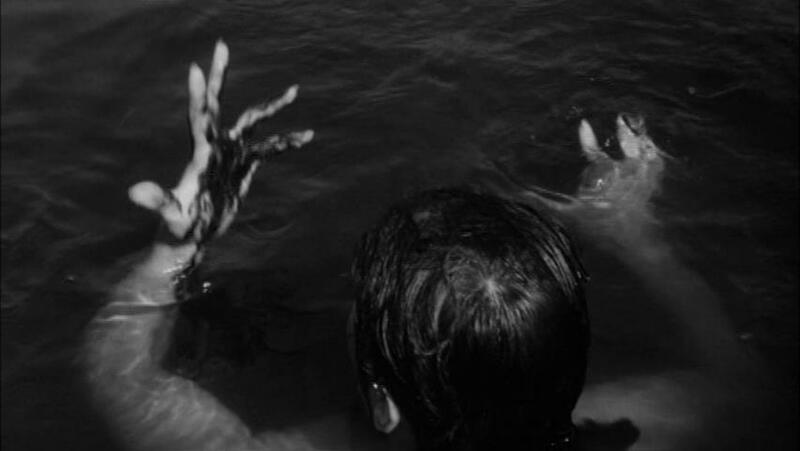 1964’s The Flesh Eaters dives right into the horror and does so fairly effectively from the get-go. The movie opens with a young couple playing around on a boat out at sea. The couple is playing the types of games that one might expect a young couple to play when there are no other eyes around. These games would include the young man ensuring that his girlfriend loses her top. No, you don’t get to actually see anything. This was a mainstream release for 1964 after all. She dives into the warm waters to protect her modesty, and joker boy dives in right along with her. As she splashes about demanding her top back, he disappears beneath the waters. She anxiously treads water waiting for whatever trick he’s about to play. And then… Nothing happens. She begins to suddenly twist and turn in the water as she looks around her in hopes that he’ll pop back up above the waves and grows more and more nervous as he doesn’t appear. Moments pass without any sign of him, and she begins to scream for him over and over again. And then it happens. The waters around her begin to change color and grow darker, and an ominous and unnatural sound fills the area. She brings her hands up out of the water and screams at the sight of the blood covering them. Her screams don’t last long, however, as she quickly sinks beneath the waves. I’ve always felt that it was an amazingly effective opening for the film and one that actually works on a pure horror level better than anything else in the film. I really wouldn’t be at all surprised if that sequence did to some audience members in 1964 what the opening of Jaws did to so many more just a decade later. Out of the horror and into the hard luck we go as we jump straight into meeting our main characters. Grant is a down on his luck pilot, and times are apparently so tough that he’s not too far removed from losing the source of his livelihood; his beat up old seaplane. Enter Jan. She works for a drunken actress, Laura Winters, played by a wildly overacting Rita Morley in her fifth and apparently last credited role. It seems that the tipsy thespian needs a plane to get her to her film shoot and she needs it now. Safety is no issue as she doesn’t care about the massive storm heading in, and money is no option as she throws triple Grant’s usual fee at him to get him to fly them to the location of her star turning role. As our trio is zooming along to get Ms. Winter to her destination, the plane runs into complications mid-flight, and Grant is forced to bring it down on a small, remote island. The three of them decide to see where they’ve landed when the ladies break out into a screaming contest thanks to the Creature from the Black Lagoon walking up out of the surf and straight towards them. 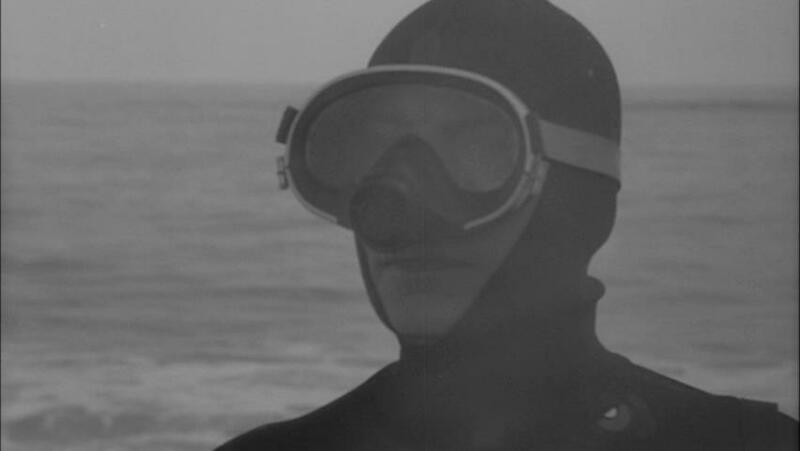 Well, actually it’s Professor Bartell in a really clunky wetsuit. He introduces himself and explains that he’s a marine biologist doing work on the island. He also sports a fairly noticeable accent of the German persuasion and chews the scenery like a starving animal chews on fresh meat, so you pretty much know that, given the era that this film came from, he’s not going to end up being one of the good guys when it’s all said and done. We get another screaming contest, some human remains, one big storm, fish skeletons galore, deliberate sabotage to keep Grant and the ladies from leaving, and an additional castaway joining them, and we get well into the realm of oddly glowing waters and suspenseful dangers. Oh, we also get to see our evil scientist trick someone into a death far worse-looking than being eaten while in the water with the Flesh Eaters. Bartell is revealed to be the scheming, insane German mad scientist that he is, but by the time our heroes work that bit out they’re already facing a bigger threat. Bartell, completely ignoring every story about every mad scientist creating monsters, has had a bit of an “oops” moment where his creation has managed to get way out of his control and well beyond his ability to handle it. Our heroes and our scheming mad scientist must now work together (because we all know that always ends so well for everybody) to eliminate the threat that now not only traps them on the island but has found a way to threaten them on the island and not merely in the waters around it. From that point on we get the type of enjoyable race to the finish that movies of this era often delivered. Yes, there are a couple of aspects about the end of the movie that don’t work as well by today’s standards as they did in theaters back in 1964, but it’s not enough to derail the film by any means. 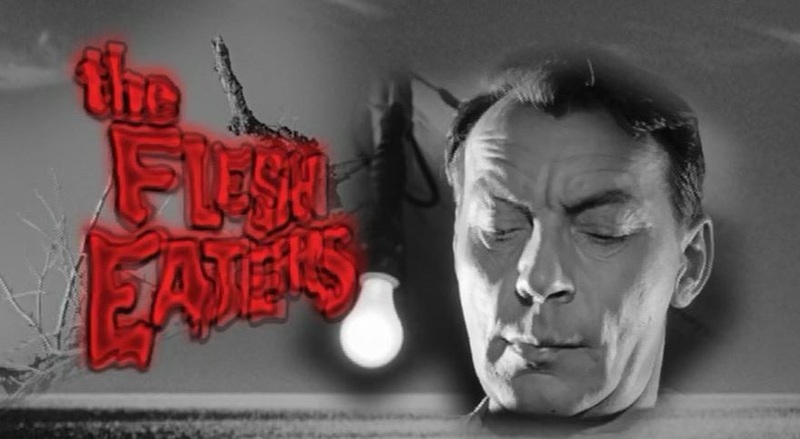 The Flesh Eaters is a wonderfully enjoyable classic from the era of paranoia, mad scientists, and the killer creations that ultimately got the better of them in the end. It’s also a film that has a few moments of beautifully constructed horror throughout the first three quarters of its run time. And if you’re willing to be a little forgiving about FX work that’s 50 years old, even the final battle for survival at the end of the film is fairly enjoyable. The Flesh Eaters is available on DVD everywhere DVDs are sold. You tell us, Nerdy Minds… Will you be giving The Flesh Eaters a try this month? Maybe you have a recommendation for good October/Halloween viewing? Let us know what you think in the comments or on Facebook! Thanks a lot! It is definitely an superb web site! blogger. I’ve joined your rss feed and sit up for in search of more of your magnificent post.